A congressional committee in Brazil has voted to reject corruption charges against President Michel Temer. The 39-26 vote by the justice committee comes ahead of the full lower chamber taking up the case. MPs are expected to follow the committee's lead. Mr Temer is accused of obstruction of justice and being part of a criminal organisation. The president denies any wrongdoing, and his lawyers have argued that the case is flawed. The charges stem from a corruption case involving the world's largest meat-packing firm, JBS. He survived a similar congressional vote in August on bribery charges. Mr Temer can only face trial with the approval of two-thirds of the lower house of Congress. 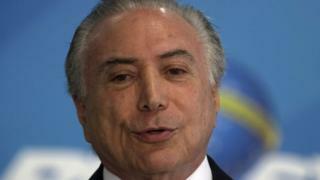 He is currently facing the worst approval ratings in Brazilian history, but lawmakers seem prepared to protect him again, the BBC's Julia Carneiro in Rio de Janeiro reports. Mr Temer became president last year following the impeachment of his predecessor, Dilma Rousseff. She was found guilty of tampering with the government accounts in order to hide a growing deficit ahead of her re-election in 2014.